Just as the focus has been removed from actual capital, and thus a distortion of capitalism, one of the effects has been to devalue the other component that actually makes it all work. Rising living standards were never the fruit of capital alone, as the real strength was in the combination of it with labor. 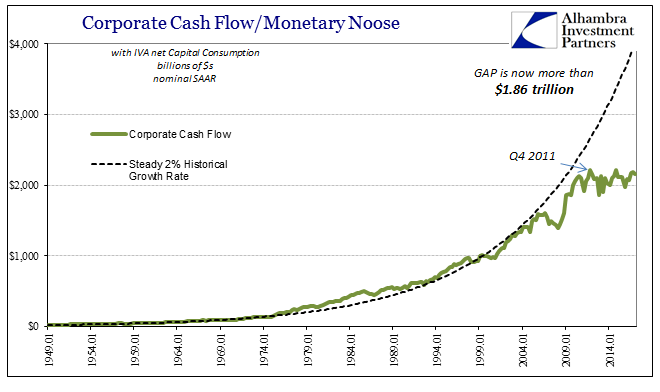 Over the last few decades, the real capital flow has been with eurodollar finance to the offshoring of productive capacity. By simple mathematics, businesses are no longer willing to afford labor. Before getting to that math, however, we need to be mindful that the “experts” are almost uniformly suggesting the opposite is true. Instead, we hear constantly of a labor shortage, often serious, whether due to Baby Boomers retiring, lazy Americans addicted to heroin, or the politics of immigration. 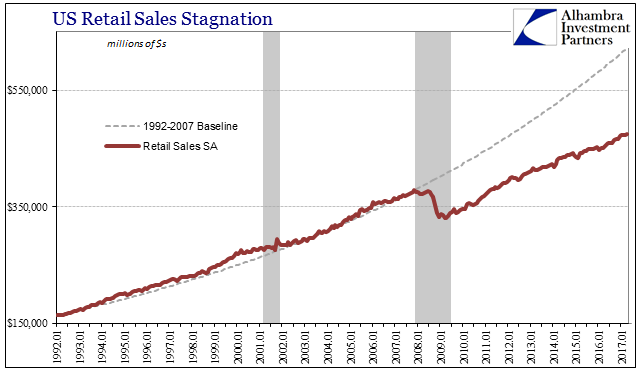 The problem with all of these is wages, meaning that if there was a shortage, wages would be rising and rising rapidly. The New York Times on Sunday published yet another of this type of account (they are becoming more frequent), blatantly headlining the piece, Lack of Workers, Not Work, Weighs on the Nation’s Economy. Focusing on anecdotes from Utah, you get all the familiar but unbacked tropes about the travails of employers who have things to do but can’t do them because they can’t find anyone. Apologies to Mr. Bingham, but that’s just stupid. What we find out instead, buried within the article, is a separate story that actually contradicts the whole thing for the umpteenth time. Companies in Utah, as in the rest of the country, were slow to raise wages in recent years. At first there were plenty of available workers. But by the end of 2015, a report by Utah’s Department of Workforce Services concluded that inadequate wages had become a key reason companies were struggling to find employees. “It was as if employers hadn’t adjusted their approach to the labor market” as the economy recovered, said Carrie Mayne, the department’s chief economist. Maybe for employers the economy hasn’t actually recovered. What the Times article contends instead is that somehow starting in 2016 of all times this maybe has changed. 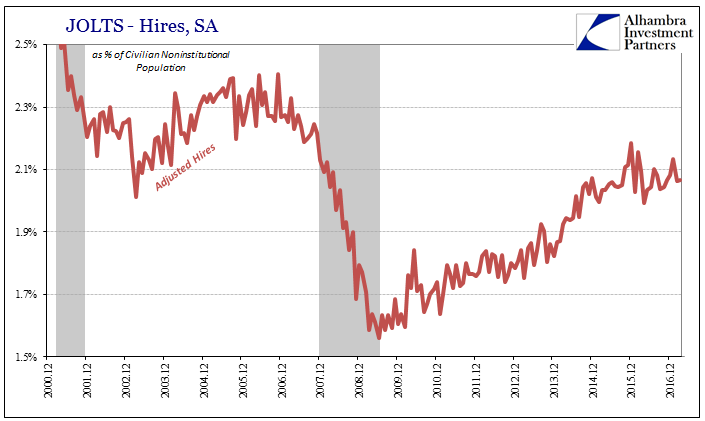 There are “signs” of wage acceleration out there, because why wouldn’t there be if the unemployment rate nationally has fallen to 4.5%? 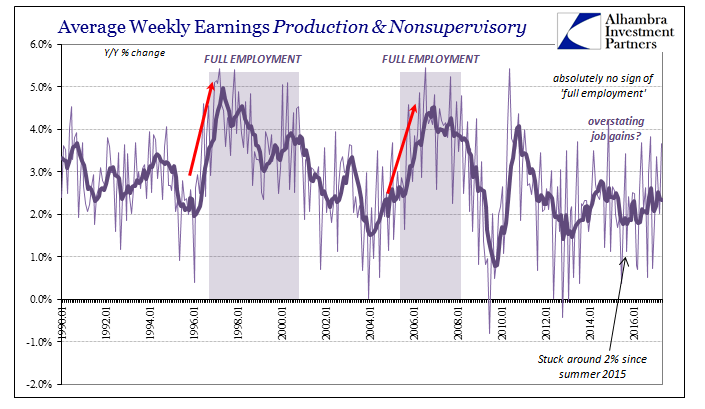 The mainstream is always seeing signs of wage growth, a condition that people long ago ignored because you can’t claim to be seeing “signs” of wage acceleration for now a fourth year running. Those aren’t then signs but delusions of clear bias. Instead, it is far more plausible employers don’t really have any ability to adjust wages. It’s as if the people who write these articles and even the economists who stand them up have no conception of revenue and expenses. 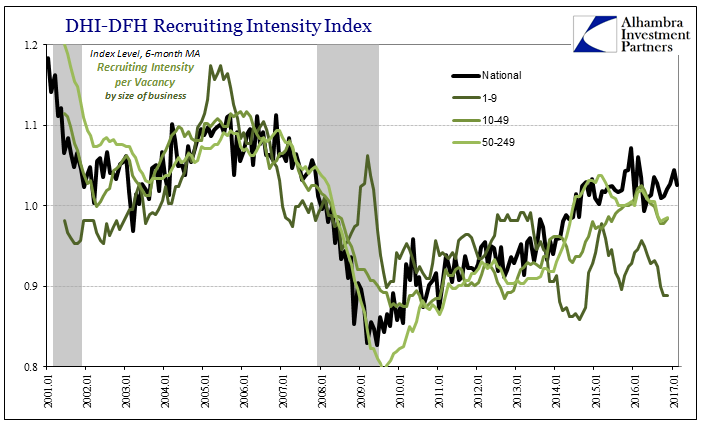 Anyone will take all the cheapest possible labor they can get, but it takes an actually growing economy with widespread, plausibly sustainable gains to give employers an impetus to actually pay market-clearing rates. That is the simple, small “e” economics left off the pageviews. “We could produce more product” has never in the past stopped businesses from paying up for labor, but it does now because there is no actual economic growth. Businesses have been maintaining, nationally, at best steady cash flow by not paying more for wages or workers; they simply cannot. 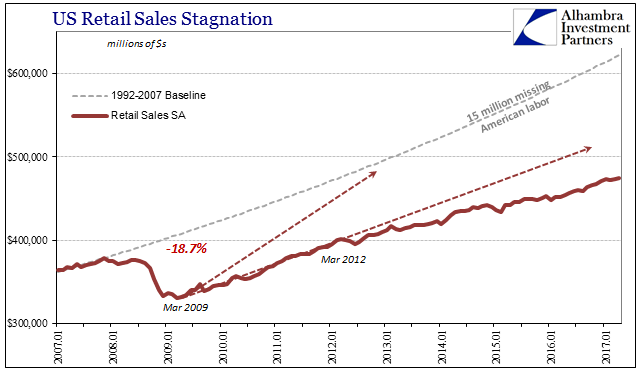 When in 2008 they initially responded to the Great “Recession” by laying off Americans at the most devastating pace since the 1930’s, they did so to retain as much cash flow as possible. That part was as of every recession in economic history. 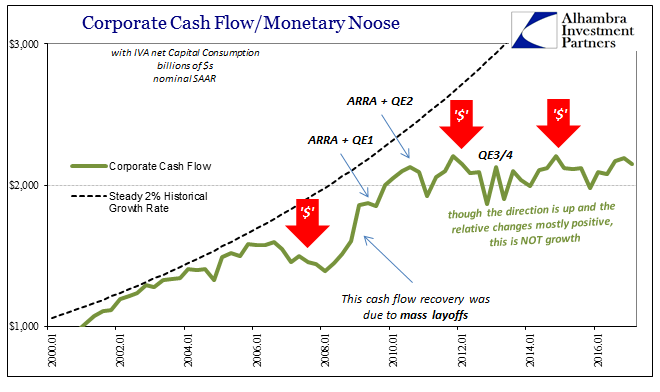 Where it all went off course was in what followed, which by any objective standard was not a recovery.  Opportunity is the lifeblood of recovery, and following even the most devastating recession there is usually widespread opportunity. The two, in fact, go hand in hand, the economic equivalent of the old market adage to buy when there is blood in the streets. What really happened in 2009 and after? Is may seem like a chicken and egg problem, but it really isn’t. By that I mean, do businesses hire more workers so that they can buy more things (including services), or must consumers, who are workers, buy more things first so that businesses hire more workers who are consumers? What if neither do either? That’s what this “recovery” has been, a grave reluctance on every side because at its most basic level the Great “Recession” was not a recession. Economists may finally know it now after ten years, but on an individual level that is how both businesses and consumers had been behaving all along. Simply calling it a recovery as every official has done does not merely make it so. 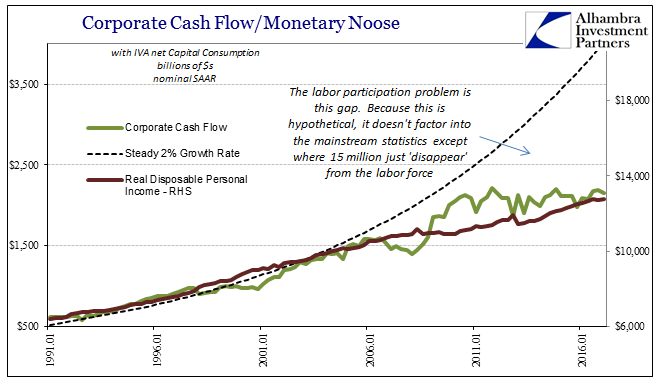 Thus, the lack of wage growth is simple mathematics, the economic equivalent of low interest rates. It is the “tight money” of the real economy where lack of wage growth, tremendous labor slack, and this unassailable business reluctance are all varying degrees of liquidity preferences. 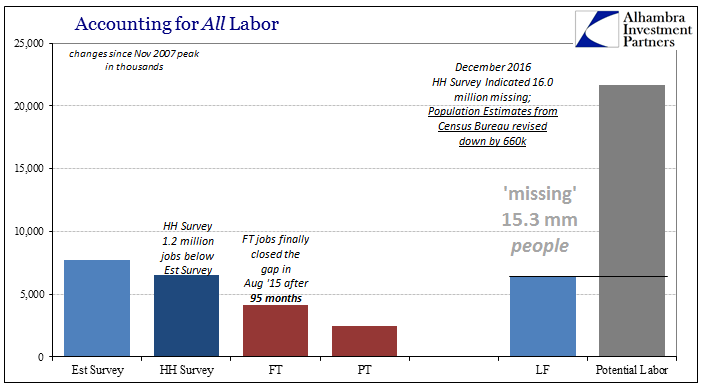 Why bump up wages to a market-clearing level when economic growth, meaning opportunity, is so conspicuously missing no matter how hard (particularly before 2016) the mainstream emphasizes it isn’t. There is, of course, more nuance to this aggregate picture, broken down across several cross sections like business size (there was something like a recovery for large businesses, but absolutely nothing like one for small firms). In whatever case, the idea that “things are better” requires both gradation as well as qualification. Where you could in the past just say things are better, you cannot today make that statement. Better than what, 2009? That’s a meaningless comparison now, just as it would have been in 2011. 2007? Even that is debatable when after ten years the economy today should be nothing like the one then, and yet it many ways it has still to catch back up (think about what it was like in 1997 as compared to 1987). In the end, all this confusion exists because the wrong measurements are employed starting with the wrong linear perspective. GDP was never meant to quantify shrinking; in fact, nothing is, which is why we have such difficulty measuring just how badly the economy has performed during a decade otherwise clearly lost. Some people see the 4.5% unemployment rate and expect it to mean 4.5% unemployment. 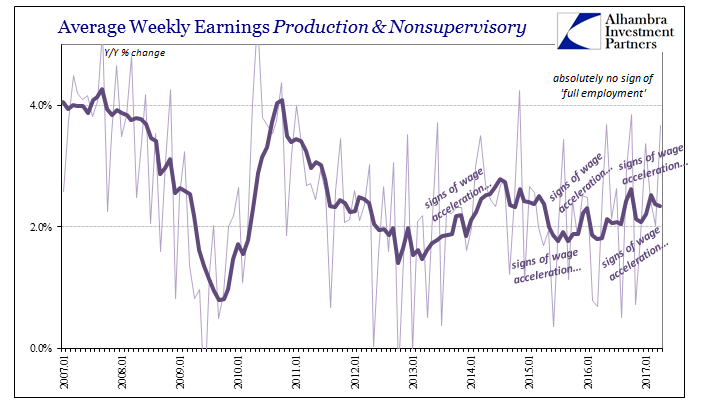 And yet, there are only signs that wages maybe at some point might want to possibly accelerate. Such convolution just isn’t necessary when simple math will do.